Paradise Found…… 12 Silver Moss, Kiawah Island. No matter what you consider Paradise, Kiawah has it. Pristine Beaches, World Class Golf, In Shore and Deep Sea Fishing, Nature Watching, Kayaking, World Class Tennis, Fine Dining….. in a single word, Paradise. Enjoy Paradise in a beautiful 4 bedroom, 3.5 bath, home that can sleep up to 8 people. The home is on a quiet cul-de-sac with a large screened porch that overlooks a quiet lagoon and the 14th fairway and green of Turtle Point Golf Course by Jack Nicklaus. The neighborhood has a private swimming pool that is only accessible by residents. The beach, which was awarded as one of The Travel Channel’s 10 Best USA Beaches, is less than a 3 minute walk. The main floor has a spacious open feel that includes the kitchen, dining room and family room which is great for entertaining. This Great Room has sliding doors that lead to the screen porch and allow for great views of the lagoon from inside or out. The great dining room table is a round table that seats 8. The master bedroom is also on the main floor with sliding doors leading to the same screened porch. The master bathroom has double sinks, a walk in shower and a tub for relaxing after a long day at the beach. The screened porch has a great porch swing and comfortable patio furniture to enjoy the early morning or evening breezes. The second floor has the 3 remaining bedrooms, 2 bathrooms, the laundry room with washer and dryer and a bonus Entertainment Room with a couch that has a pull out bed. Two of the spacious bedrooms have two double beds each and the third has two twin beds. All of the upstairs bedrooms have doors to a common deck that overlooks the lagoon and golf course. 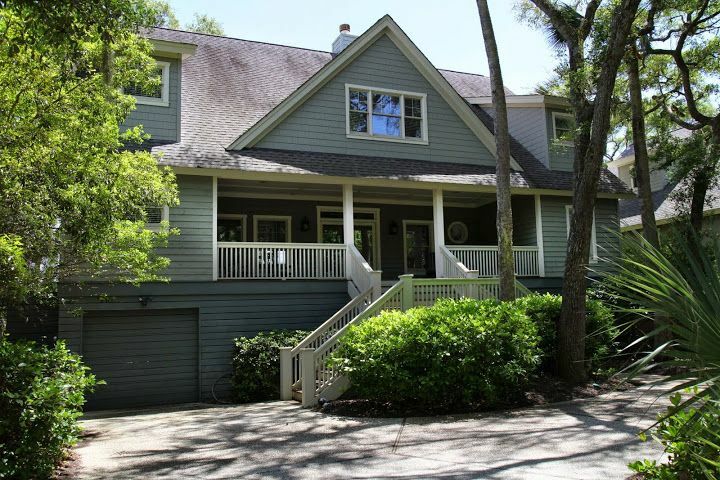 This beautiful home will help you enhance your Kiawah Island Experience. It allows for a large gathering in the Great Room or quiet alone time with the upstairs for the kids to watch movies and play games in the entertainment room. One of the upstairs bedrooms has a TV too. The downstairs great room has a plasma TV, DVD player and a stereo system. There is wireless high speed internet. * The crown jewel in Kiawah's extraordinary oceanfront setting, The Sanctuary Hotel and conference center with its restaurants, bars, and spa. Great place at Kiawah Island! Thank you so much. I am so glad you had a great vacation. Hope you will be back soon, we love our repeat guests. Beautiful home close to the beach and the pool. Nice house and owner/manager very helpful. We had a wonderful week! The house was very comfortable and just a short walk to the beach. Thank you for sharing your home. Thank you so much!! I am so glad you had a great vacation. We love repeat renters so please come back soon! Our family enjoyed everything about this house. It was roomy for our 4 adults and 2 children. It was spotless upon our arrival, nice furniture, comfortable mattresses, good pots n pans, and a fabulous screened in porch with a large swing. The proximity to the community pool and beach was fine, a quick walk or bike ride to both. Thanks so Much! We hope to rent it again next year. The entire family joined us for a vacation in Kiawah this year and the property was just the spot to stay. Everything from the linens to the kitchen exceeded expectations. The family spent evenings on the back porch after dinner. We are planning now to stay here for our next vacation. We will be back! I am so glad you enjoyed your stay. We do everything we can to keep the house updated. We love the back porch too. Thank you. This was our 4th time staying in this lovely home. We love everything about it!! The location to the pool and beach is perfect. The home is extremely well equipped with everything you need and it is very homey. And, the huge screened-in porch overlooking the golf course and lagoon is the perfect way to start and end your perfect day on Kiawah. We will definitely be back!! !